How can the younger generation get on the UK's Property Ladder? For many in the UK, the hopes of getting on the property ladder is a far off reality. The cost of living is so high and the current property prices are so far out of reach it seems impossible to be able to achieve. The only hope is inheritance from a family member or winning the lottery. We can’t leave things to chance so how on earth can we get on that first step? The two main things you need are a reliable income and a deposit! Yes, a deposit! The major problem for most non home owners. It seems to be a vicious circle doesn’t it. The only hope is to live as cheaply as possible and save as much as possible in the meantime. With rental prices on the up again being able to save money can be very tough, there always seems to be so much month left at the end of the money! Tiny Houses are a huge hit in the United States, Canada and Australia and is gradually catching on here in the UK. People are looking at small living for a couple of reasons. a) to be able to live a greener life and help the environment and b) Live cheaply which gives them more income to save for a deposit on a property bricks and mortar property. Tiny Houses are very cheap to run. They are fully insulated, can have everything you would expect in a small property and use very little energy to heat them. The compact design creates an ideal mix of space and functionality giving you everything you need to live economically. As an example, Depending what area you live in, a bedsit or a room to let could cost you in region of £350-£550 per month. In most cases you would have to share the rest of the property ie kitchen, lounge, bathroom and toilet which can become quite hectic in most households. If you were to rent for a 4 year period, you would have spent on average over £20,000 on rent alone with nothing to show for it at the end of the term. By having your very own Custom Built Tiny House, the money you spend to pay for it would be considered an investment. Even if you were to get finance or a personal loan from your bank with similar monthly repayments you would still own your Tiny House which could be sold if and when it is no longer needed. They are built robustly like a house not a shed with long life and resale value in mind. After a lick of paint and fresh décor, the resale value could be not much less than what it cost a couple of years before. The other problem is where to put it. The garden of the family home is the obvious choice but you would need planning permission if you were to use it as a dwelling. A better idea would be a small bit of land but again planning permission would be an issue and the cost of the said plot of land in the first place. If you like this idea, please like our Facebook page and share it with as many people as you can. Ok, its a Tiny House not a proper bricks and mortar property but its a start! Take University Students as an example. They get accepted at a University in most cases away from home so have to stay in digs. The next step would be to gain student finance. The largest outlay for a student in this situation is living (Rent and Bills). Most students that have completed their term at uni then have to face the fact that they are £30,000 in debt, in some areas it could be as much as £50,000! Great start to working life... not! Fully "OFF GRID" Tiny House communities could be just what they are looking for. The cost of a fully off grid tiny house would be roughly £20,000 - £25,000. The huge plus sides would be: a/ You are off grid so your bills are very small. 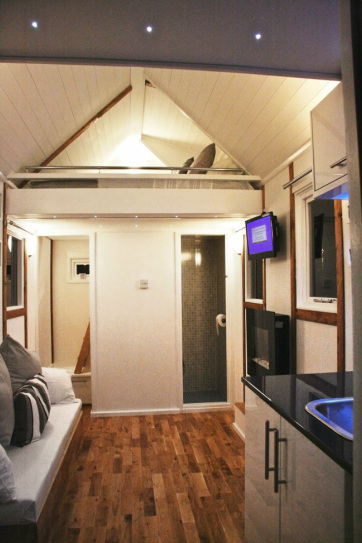 b/ A tiny house is approx 135 sq ft that ALSO has its own Shower room, WC, Double bed, Lounge and small Kitchen area. c/ At the end of Uni, you then have a Tiny House that is yours and can sell to another new coming student and get 80% of your money back which you can use to pay off the rest of your load! Debt free! Throughout the country there are thousands of small pockets of unused, overgrown land owned by councils. Now put all the above together in one senaryo and what do you have? Make good use of unused land. Giving students a great "Starter home" Opportunity. Reduce student debt. (after all, these are the people who will be running our country in time).